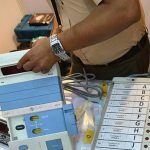 The 17th Lok Sabha elections will be held in seven phases beginning April 11 and the votes will be counted on May 23, the Election Commission announced on March 10. Elections to Assemblies of Andhra Pradesh, Arunachal Pradesh, Sikkim and Odisha, and the bypolls to 18 Assembly seats in Tamil Nadu will follow the Lok Sabha election schedule in their respective States. Bypolls to three Assembly seats won’t be held due to pending election petitions, Tamil Nadu CEO Satyabrata Sahoo has announced.